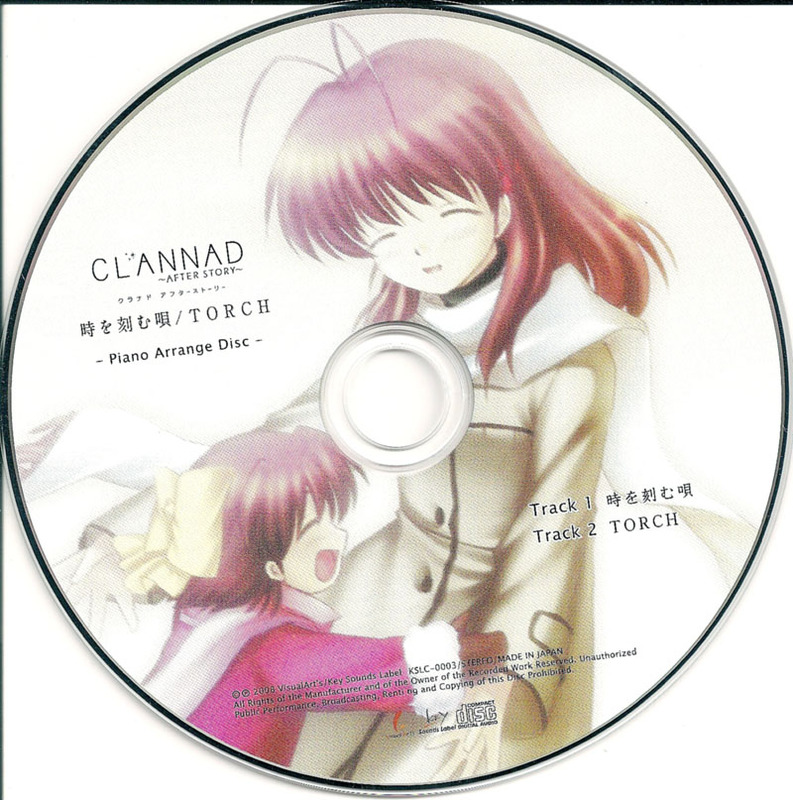 Review: By this time, I can’t blame you if you’re sick of reading about Clannad ~After Story’s~ OP/ED “A Song Engraved in Time” and “TORCH” on this blog and hopefully, this review of the piano arrangement album will be the last. So to begin, I was mildly surprised that this album got released at all because in my review of the OP/ED Single, I noted that “A Song Engraved in Time” is an arrangement of “To the Same Heights” on the Clannad Original Soundtrack and that piece already has a piano arrangement on the Clannad/Tomoyo After Piano Arrange Album. As such, having yet another arrangement feels unnecessary and the only two reasons that came to mind as to why this album came into being was that someone wanted to make an arrangement that includes the introduction section in “A Song Engraved in Time” and arrange “TORCH’s” melody. The piano arrangement of “A Song Engraved in Time” stays faithful to the original, which might not be a bad thing at first glance except that the similarities are just far too close, which leads to an underwhelming listening experience for those who were expecting something new. As such, this track’s biggest fault lies in the creative (or lack thereof) aspect of its execution. By being too faithful without adding in any meaningful changes to spice it up and make it interesting, the arrangement becomes stale simply because it brings nothing new to the table. Furthermore, it doesn’t help that the source itself is more enjoyable than the arrangement because the pianist simply can’t convey the range of emotions that Lia’s voice is capable of rendering. An excellent example is during the motive that plays between 1:55-2:14 (see sample below), which doesn’t feel quite as poignant and dramatic as it does in the original version. Admittedly, the faults are pretty small, but together, they make listening to this track feel less satisfying overall which, when combined with the lack of creativity in its arrangement, means that this track falls short of its potential. Yes, maybe I am being a bit too harsh by chiding this arrangement since most people who are going to get this album simply want to hear a piano version of “A Song Engraved in Time.” And to be fair, they get a good track that is nowhere remotely as disastrous as TAMUSIC’s Haruhi arrangements. Still, my prior experience with piano arrangements of Key’s works had primed me for something a bit different and fresh, which is why I was disappointed with the way this track turned out. They’ve certainly done better in the past. However, listening to “TORCH’s ” piano arrangement dispelled the disappointment since this track definitely improves upon the original, making it a worthy piece in its own right. The celebratory introduction is discarded in favor of going right into the part during which Lia’s voice enters the piece in the original version except this time, the harmony doesn’t jump around so much as to create the jarring transition from “A Song Engraved in Time.” The piece starts off with a slower, more melancholy feel that doesn’t quite possess the festive mood of the original, but it builds up slowly and wonderfully until it reaches the joyful chorus section which is still as upbeat and optimistic as ever. Maybe even more so. One thing to pay attention to as you listen to this track is the way the harmony adds a layer to the piece to make if feel just slightly more vibrant than before and the little flourishes here and there keep it fresh and interesting without feeling as though they were afterthoughts. The changes are fairly subtle, but by doing so, the overall mood and atmosphere of the original is enhanced and this arrangement makes for a very enjoyable listen. Musically, this album is solid because both arrangements are fairly strong and their take on the original melodies are worth checking out. Although “A Song Engraved in Time” is too close to a carbon copy of the original, “TORCH” makes up for that creative deficiency with an arrangement that is more reserved, but stands out on its own as an improvement on the original melody through its more poignant rendition of the theme. So while I can complain all day long about the dubious amount of creativity in the first track, Clannad fans should not be dissuaded by the issue since it’s a competent arrangement overall. For everyone else, I’d still say that there’s enough mileage that can be had such that this album should be given a chance at the bare minimum.